The ear of labiatae perennial herb Prunella vulgaris L.
When the ear half is dry in summer. Big ear in brownish red, making noise when being shaken, light and soft, not easy to be broken. Bitter and pungent; liver meridian entered. Clear and purge liver fire, relieve toxicity and dissipate nodulation. Being bitter and cold, entering liver meridian, and being liable to clear and descend, it is good for up-flaming of liver fire, manifested as blood-shot and swollen eyes, headache, and dizziess. For eye diseases due to liver heat it can be used alone. For instance, the soaked one in granulated sugar water is especially indicated for painful eyeballs. For clearing liver heat and improving vision, it is more often combined with herbs, such as Ju Hua, Jue Ming Zi and Qing Xiang Zi. For painful eyeballs, and getting worse nighttime due to liver deficiency, it is combined with herbs for nourishing liver yin or blood, such as Sheng Di Huang, Dang Gui and Bai Shao, etc. They are combined together in Xia Ku Cao San from Zhang Shi Yi Tong (Zhang's Treatise on General Medicine). For headache and dizziness due to liver fire, it is combined with liver-soothing and liver-clearing herbs such as Ju Hua and Jue Ming Zi. Modern research showed that it has certain actions of lowering blood pressure. 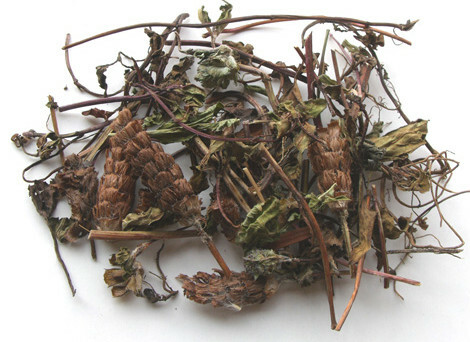 Therefore, it is often used for treating liver-heat hypertension manifested as headache, dizziness, irritability,etc. For yin deficiency with hyperactivity of yang, it is combined with yin-nourishing and yang-subduing herbs. It can clear liver and purge fire, and be used for scrofula, goiter, and hyperplasia of mammary gland caused by liver qi stagnant transformed into fire, which burning the fluids into phlegm. 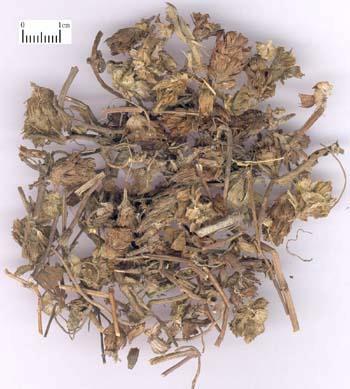 It is usually combined with phlegm-resolving and nodulation-dissipating herbs. For instance, it is combined with Hai Zao, Bei Mu, Xuan Shen, etc., as in Xiao Lei Wan from Yang Yi Da Quan (A Complete Handbook on Traumato-Orthopedics). It has the actions of clearing heat and relieving toxicity, and can be indicated for mammary abscess, swollen sores, mumps, and red and swollen sore throat. It is often combined with heat-clearing and toxicity-relieving herbs to strengthen the effects.